We are SUPER excited to bring you more Zeroboxer fun. 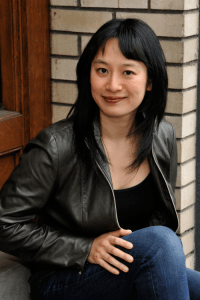 Be sure to check out our interview with author Fonda Lee and the Zeroboxer Trailer. Today we have the transcript from a fan interview with Carr. We hope you enjoy getting to know him, we think he’s a keeper! Today we’re happy to post an interview with zeroboxing star Carr Luka. Luka was interviewed by the fan feed Float ‘Em while on a publicity tour of Earth sponsored by the Zero Gravity Fighting Association. He answers questions about his career, personal life, and the state of the sport. Float ‘Em: Thank you for being here Carr. Tell us how your tour is going so far. Carr Luka: Thanks, it’s been great. Living on Valtego [city station], there are things you miss about Earth. It’s amazing to meet all the fans and aspiring zeroboxers down here too. FE: You’ve really catapulted into the spotlight recently with your recent big wins in the Cube, and now the ZGFA is putting a lot behind your tour. That’s quite a bit to handle for someone still a couple months shy of his eighteenth birthday. How are you dealing with all the sudden attention? CL: It’s been pretty crazy, I’ll admit. When it gets kind of overwhelming, I try to remind myself that in the end, it all comes down to what happens in the Cube. I’m a newbie at all this touring and marketing stuff, but I’ve been fighting in the Cube most of my life, so I try to focus on that. FE: So why zeroboxing? How did you get your start in the sport? CL: I’m from Toronto and lived on Earth as a kid, so it wasn’t an obvious thing for me to get into. I was always into sports and being competitive, and I started gymnastics and kickboxing when I was really young. My coach found me at a local kids tournament and thought I had what it took. So I really owe him for bringing me up to [the orbital gym] Xtreme Xero and believing in me that much. I used to take the lunar commuter bus to the gym on Thursday afternoon, miss school on Friday, spend the whole three-day weekend training, and fly back down on Monday morning. That’s not including the land training I had during the days I was on Earth. When my tournament schedule got heavy, I had to do remote study and finish homework on flights between events. So yeah, there’s a big investment if you want to eventually do it as a career. FE: Why do you think zeroboxing has really taken off in popularity in the last few years? FE: There have been a few ZGFA fights cancelled lately due to fighters being caught taking performance enhancing measures. Do you think there’s a problem with PEM in the sport, and are the current screening methods sufficient? CL: There’s definitely a problem, though it’s not unique to our sport. With the types of nanos and somatic gene procedures we have now, there are just more sophisticated ways than ever to cheat. Screening is important, and I think for the most part the ZGFA takes it really seriously, because they owe it to the zeroboxers and the fans that the fights be clean. FE: Do you have any advice for amateur zeroboxers looking to one day fight professionally? CL: It’s different when you get to the pros, for sure. You have more time between fights, and there’s a lot more riding on each fight, so you have to be really disciplined about training and able to handle the pressure of the big day. It’s also easy to get thrown off by the fact that you’re living on Valtego and there’s a lot to distract you. I’d say the biggest thing is getting as much time in orbit as you can early on. Having a good space ear is really, really important at this level. Get as much competition experience as you can. You can’t rely just on having a good flying game or a good grabbing game—they both have to be top-notch. FE: Rumor has it you are dating your brandhelm. Care to confirm or deny it and end the suspense of your female fans? CL: [laughs] Yeah, my brandhelm Risha and I hit it off pretty quickly. She’s great. She’s half-Martian, so she’s totally got that way of giving it to you straight. It’s kind of scary how much she can get done. We’re both a bit obsessive about what we do, so the other person gets it when we’re like, head-down intense on something. There’s this great feeling knowing we’re supporting each other. FE: What are three little known facts about you that you’d like to share with fans? CL: I’ve only thrown up in zero gravity twice, but they were both really epic. I won’t go into the details. I got my Cube name [“the Raptor”] because my first nickname around the gym was “Last Man Standing” and my coach was like, “That is way too long, how’s a fight announcer going to say all that without taking a breath in the middle?” My old school mascot was the Falcons, and I was known for being a strong flier, so I thought I’d go with that, but my friend Enzo said, “You’re more badass than a falcon, you’re like a super-falcon. You’re the Raptor.” So it stuck. One other thing, huh? I’m a sucker for key lime pie. For more Zeroboxer excitement, check out the other online and live launch events including readings, blog posts, interviews, giveaways, and special features.